Former Husker Rex Burkhead made an 11-year-old's first NFL game a memorable one. KANSAS CITY (KMTV) — Last Wednesday, 11-year-old Taylor opened a box which she thought contained new softball shoes. Inside, however, was something much more memorable for one Rex Burkhead's biggest fans. It was two tickets to the AFC Championship game from her mother Jacquee. "I get to see Rex Burkhead!" Taylor shrieked in excitement. Her mom recorded the moment on her phone & posted the video to Twitter. "This was a once in a lifetime opportunity and I knew i had to do this," Jacquee said. After Jacquee posted the video, the former Husker quickly retweeted it saying: "Thanks for all the support Taylor and enjoy the game! GBR/Go Pats!" The original video has over 300 retweets and over 3,000 likes. "You don't see a lot of positive things on the internet anymore with social media," said Jacquee. "I was really surprised that it is all love." 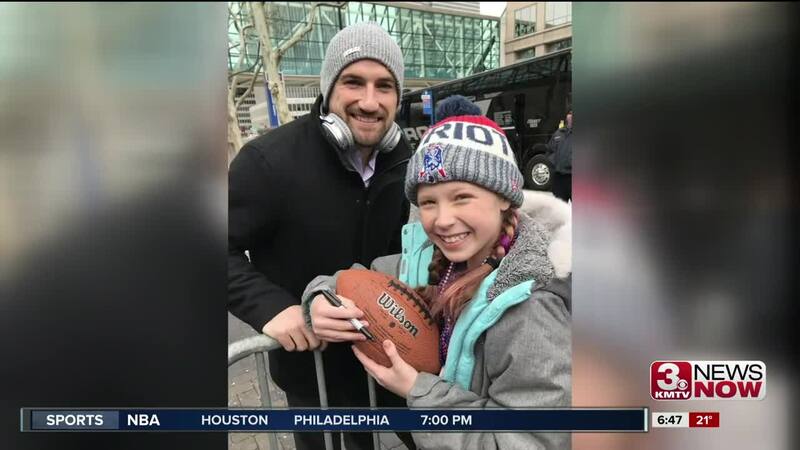 The mother-daughter duo from Nebraska drove down to Kansas City Saturday night then waited outside the Patriots' team hotel for three hours Sunday afternoon in freezing temperatures just to catch a glimpse of the New England running back. The wait paid off as Burkhead walked right over to Taylor. "He came out and signed my ball and he said 'Taylor that video was very cool'," Taylor said. The eleven-year-old proved to be a good luck charm as the NU alum scored two touchdowns including the game-winner in overtime . "It was awesome and amazing," said Taylor. "He is an amazing person," Jacquee said. "He's the best role model any parent could hope for for their child." Burkhead and the Patriots will play fellow former Husker Ndamukong Suh in Super Bowl LIII on Sunday February 3rd in Atlanta. You can watch the game right here on KMTV.